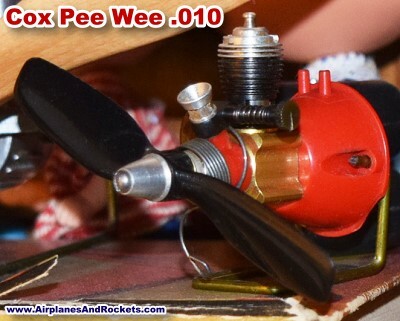 My Cox Pee Wee .010 engine sits on a shelf above my computer monitor, along with a small collection of other vintage aeromodelling paraphernalia. They serve as a reminder of the good times as a kid building and flying (and crashing and rebuilding) back in the 1960s and 1970s. 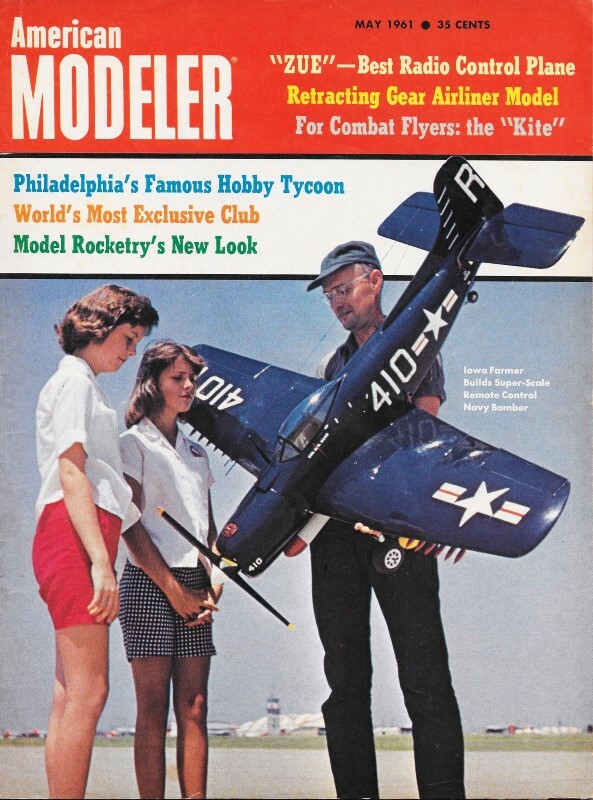 I don't recall what airplane I had it on - maybe a homebrew free flight job. Unlike .049 Babe Bees and Golden Bees which I had a few of, I only ever had one of the .010s. They were more of a curiosity than a 'thing.' In this article, the author's suggestion that indoor control line might be a possibility was wishful thinking since even if the building proprietors were willing to suffer the ear-splitting noise, they would unlikely put up with fuel mess all over everything. It's so small you have to look twice to see it and even then half of what you see is fuel tank! The "Sixty-One-Der" line of new engines from the L. M. Cox Manufacturing Co. Inc., Santa Ana, California, introduces the very smallest mass produced glow plug engine in the world. But smallness alone is not the only attribute of this little gem. It is also the first engine to our knowledge that turns up an incredible 27,000 rpm without the aid of a flywheel! Smallness and simplicity of design do not necessarily go hand in hand and the .010 is a prime example. There are 25 separate parts that go into its assembly ... 26 if you separate the connecting rod from the piston. This is considerably more than we have seen on any two-cycle engine. However, we understand that all the "Tee-Dee" Contest front rotary valve engines for '61 will have about this same number of parts and will be of the same basic design as the .010. As we have said many times the problem with small engines aside from the minuteness of parts and the exceptionally close tolerance that must be maintained for successful operation, is that of "carburetion." 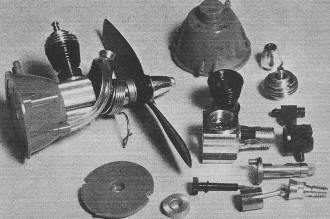 Cox engineers, through use of specially designed equipment have licked the quality control problem of the small engine. In an effort to get greater atomization of fuel in the .010 they have utilized the very successful although complicated system first introduced in their Thermal Hopper. In this system, fuel is first introduced into a collector ring via a single hole located in the needle valve body which forms the outside wall of the ring. The amount of fuel is controlled by the needle valve as in conventional systems. However, the fuel then enters the intake tube through three very small holes evenly spaced around a recess in the intake tube. By increasing the number but reducing the size of each orifice through which fuel passes, greater atomization is achieved. There is one important requirement to this system as it applies to so small an engine as the .010. Cleanliness! Particular attention must be paid to keep these holes free of any foreign matter. The smallest amount of dust or dirt can clog them making the engine inoperable. We suggest that the fuel be filtered, preferably through special filter paper that your local druggist can supply. Out on the flying field, cover the engine when it is .not in use. At the end of the day's flying remove the entire assembly from the engine and wash it in carbon tetrachloride to dissolve any oil residue which may later thicken and clog these tiny holes. These maintenance problems which may or may not be as critical in the larger versions were not in evidence in the Thermal Hopper but that model had its intake, tube fitted with an efficient fine mesh screen. Cox Pee Wee .010 engine assembled and disassembled. Basic design and overall appearance of the .010 follows closely previous Cox engines. However, by returning to the front rotary valve system, obvious changes are apparent. The aluminum alloy crankcase, anodized gold, makes use of a red plastic collar which fits over the crankshaft end and forms the base to which the aluminum, venturi shaped, intake tube is threaded. An aluminum ring threads onto the front of the crankcase and locks this plastic collar in place. The one piece, counter-balanced steel crankshaft, exceptionally robust for an engine of such diminutive proportions, allows for a large rectangular shaped rotary valve. An oil groove at the forward end reduces bearing friction and ensures sufficient lubrication. The drive washer is aluminum, knurled on its forward face and press fitted to the shaft. A separate propeller screw and aluminum spinner type front washer is supplied as is a black plastic 3" dia., 1.25" pitch propeller. The piston, connecting rod assembly is of the ball and socket type. It is of the same design as used on the .020 Pee Wee. The steel cylinder barrel utilizes two transfer ports located within the bridges of the two exhaust ports. It threads into the crankcase. No gasket is used at the bottom end but a copper gasket is used between the top of the barrel and the aluminum glow-head. A red plastic fuel tank acts as the rear crankcase cover also as the radial mount. It is held to the crankcase by four machine screws. The tank rear cover is held on by a single screw, centrally located. This screw is of the self tapping variety and should not be tightened excessively as you can strip the plastic into which it threads. A separate plastic rear crankcase cover radial mounting plate for use with a separate fuel tank was also provided with our test engine. The handy wrench also supplied is very important to the maintenance of the engine for without it disassembly of the engine would be virtually impossible. 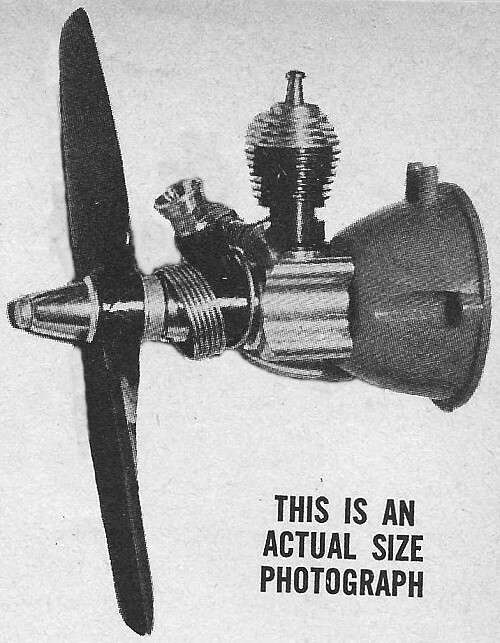 As no suitable propellers other than that supplied with the engine are commercially available our test runs were conducted purely to ascertain the running characteristics of this powerplant. Thimble Drone fuel was used throughout the test. Since operating manuals were not yet available our first attempts at starting the .010 with the proper needle valve setting were a bit lengthy. However, once the adjustment was found, starts were relatively fast due in part to the spring type starting device supplied. Hot starts were not quite as rapid as with bigger Cox powerplants, but the engine cools off quickly so actually little time was lost between starts. While running is quite smooth for an engine of so small a displacement, our test engine appeared happiest at its top rpm. Our observations indicated that the 27,000 rpm figure as stated by the manufacturer is well within the limits of probability. It is quite conceivable that the introduction of this engine may be a determining factor in starting the trend toward more control line flying indoors in auditoriums, school gyms and armories or backyard flying where the noise factor and limited space had previously not permitted such activities. Then too, how about multi-ships with up to four engines in A/8?